The chapter deals with the process of identity (mis)recognition that has led to the rejection of an asylum seeking application. Spotti addresses discrepancies between the story narrated by the asylum seeking applicant and the type of factual knowledge sought by the officials judging the truthfulness of his identity claim, as well as between official naming practices and the locally based naming of things used by the applicant. The case documented here, demonstrative of a politics of suspicion, also serves the metonymic function of laying bare some of the torn ligaments around the bones of globalization. It encapsulates how migratory experiences are registered into administrative prescriptive accounts of how one should prove his own identity. The present paper—part of a larger ethnographic enquiry aimed at documenting and understanding the process of doing asylum seeking in the age of globalisation—deals with the process of identity (mis)recognition that has led to the rejection of an asylum-seeking application. More specifically, the paper documents two things. First, it documents the discrepancy between the story narrated by the poorly educated asylum-seeking applicant (see Danstrøm and Whyte, this volume, for a discussion of the role of narrative in asylum determination) and the type of factual knowledge sought by the officials judging the truthfulness of his identity claim. Second, it documents how the lack of factual knowledge is a product of a discrepancy in naming practices, i.e., the discrepancy between the official naming of things and places of interest drawn by the authorities from the internet—and the locally based naming of things used by the applicant. The case documented here, as well as pointing at the politics of suspicion in the asylum-seeking procedure, also serves the metonymic function of laying bare some of the torn ligaments around the bones of globalisation. It encapsulates how migratory experiences are registered into administrative prescriptive accounts of what someone should say and how someone should name things in order to give proof of identity. Globalisation has brought about an intensification of the worldwide mobility of goods and information, but also of human beings. Asylum-seeking is one of the by-products of this mobility and it links local happenings to (political) events occurring many miles away. The EU and the ‘floods of asylum seekers’ that try to reach its soil are no exception to this. Yet, the migrants who knock at the EU’s doors pose a problem to border control authorities in that they cannot anymore conceptualise migrants as people engaged in a linear move ‘from the rest to the West’ (Hall 1992). Rather, these globalised migratory flows are at present one of the most tangible testimonies of super-diversity. That is, rather than falling into the ‘ethnic minority paradigm’ of an earlier era in migration studies, they embody what Vertovec terms, in its hyphenated version, the ‘diversification of diversity’. That is, a process in which diversity moves beyond ethnic minority group membership and boundaries and gives way to ‘an increased number of new, small and scattered, multiple-origin, transnationally connected, socio-economically differentiated and legally stratified immigrants’ (Vertovec 2007: 124). It follows that present day diversity calls for all sorts of urgent interventions that Europe, its member states and their institutions will have to face. There is the question of border control at both European as well as nation-state level. Further, there is the question of nation-states confronted with obligations to their citizens in their asylum-seeking politics, policies and practices and last, there is the question of securitisation of borders that brings up issues of institutional framing of the identities of the newly arrived migrants within a regime of suspicion. In reaction to the above, the EU engages in deploying strenuous efforts to safeguard its maritime shores and territorial borders. Typical of these efforts are those measures that set up—to borrow Bigo’s terminology (2008)—a ‘ban-opticon’, that is, a means for channeling mobilities, modulating their intensities, speed, mode of movement and coagulation through measures of surveillance. Language is also an element taken up for surveillance administered at the institutional gates of each nation-state, e.g. the testing and consequent measurement of someone’s proficiency in the language of the host country (see for instance Kurvers and Spotti 2015) but also in the language of the country of origin (see for instance Spotti 2015). Shibboleths of securitisation, however, are also present once the asylum-seeking migrant manages to enter the EU. When entered, in fact, nation-state based institutional bodies are put in place with the task of gathering information about someone’s history of migration and of assessing the truthfulness of his/her narratives on the basis of a search in the applicant’s narrative for tangible, factual, proofs of identity. As Craig and Zwaan note (this volume), it is not only the responsibility of the asylum seeker but also the determining state to gather such evidence. These proofs of identity rest on the ‘ergoic’1 equation that, if you know facts X and Y, then you really ought to be from place Z and thus be who you claim to be. With this backdrop in mind, the present paper focuses on a rejected asylum-seeking application in Flanders, Belgium. The story concerns an unschooled illiterate young man, whom for the sake of argument here we call Bashir, who claims to be from a particular country and more specifically from a specific city within it. The letter of rejection of his asylum-seeking application, a by-product of the bureaucratic production of textual artefacts within the Belgian asylum-seeking procedure, is our key text here. After dealing with language in intercultural and multilingual institutional encounters like the one of asylum, this chapter presents an analysis of Bashir’s life story, appropriately anonymised, and of the letter of rejection that he had received from the authorities assessing his application during the time in which I was carrying out my ethnographic interpretive fieldwork. We then tease apart the motivations that led the authorities to conclude that Bashir was not the nationality that he claimed to be and, in so doing, we focus more closely on the practice of naming places and the internet. It is when the referents encounter an institutional figure, for example, a police officer enquiring about their conduct and asking for their name and proof of identity, that naming becomes a verifiable matter. A matter that brings along with itself the issue of identity as it can lead to identity (mis)recognition and dismissal. Along this line, the analysis I present confronts and compares Bashir’s story and practice of naming with the information gathered by the institutional figures that are in charge of assessing his application. This is further confronted with an interview carried out with another refugee from the same country, whom I call Majid, and who is used here as tertium comparationis in that he knew Bashir and his case. The implications of Bashir’s case—as the analysis and its interpretation point out—are both analytical and societal. They are analytical in that they display the influence of the web and its authority in the process of asylum approval and with that the discrepancy between the web-based (toponymic) knowledge that the immigration authorities expect to hear from the applicant and the local register used for the naming of places. They are societal in that they show how a discrepancy between applicant and authorities in the form of knowing and naming places is taken to be a valid proof that corroborates the politics of suspicion (Bohmer and Shuman 2018) that characterise the institutional side of asylum seeking applications in present day Europe. Although nation-states across Europe have their own idiosyncratic differences in dealing with asylum seeking applications (UNHCR 2013), the sociolinguistic, sociological and discursive processes that are embedded in this procedure have already awakened the interest of several disciplines ranging from sociolinguistics to discourse studies to the sociology of transnationalism (Blommaert 2005; Marijns 2006; Fiddian-Qasmiyeh et al. 2014). For instance, among the procedures studied, there are the institutional encounters between authorities and the applicant, who has to prove the truthfulness of his migration story, of his origin, and through that give tangible proof of identity. In the gamut of organisations involved in serving asylum seekers and supporting them in their claims, we see that the encounter with the institutional reality that will have to assess their application is still central. It is the institutional environment where the interview with the applicant will take place—which functions as an extension of the nation-state authority—that imposes its language norms, literacy norms and requirements of factual knowledge upon an applicant engaged in telling his/her migration and asylum story. Straightforward as it may seem, the encounter between the authorities on the one hand and an applicant on the other gives birth to a complex sociolinguistic environment. As Jacquemet points out in his work (2011, 2013), these institutional encounters become loci of trans-idiomatic practices, that is, loci where multilingualism is the common currency and where the multilingual interactions between the authorities and the applicant are made even more complex by the digital interfaces that both applicants and authorities use during their encounter. As I show later in this text, on the side of institutional authorities, we often find the use of available web-based resources dealing with the country of origin the claimant claims to come from. On the side of the claimant, in contrast, we often find electronically mediated communication and identity profiles, e.g. through social media channels, that aim at corroborating identity claims (Huysmans 2014). According to the Dublin Regulation, the asylum applications for which Belgium is responsible are transferred to the Commissariaat General voor de Vluchtelingen en de Staatslozen (henceforth CGVS). The CGVS, an independent administrative authority, is exclusively specialised in asylum decision-making. In a single procedure, it examines first whether the applicant fulfils the eligibility criteria for refugee status and whether they are eligible for subsidiary protection status. The CGVS holds four competences. It grants or refuses refugee status or subsidiary protection status. It decides on the admissibility of asylum applications of EU citizens, persons from a safe country of origin or persons already having obtained refugee status in an EU Member State that is still effective, and of subsequent applications. It applies cessation and exclusion clauses or revokes refugee or subsidiary protection status (including on the instance of the Minister). It confirms or rejects the refugee status of a refugee recognised in another country. Last, it rejects asylum applications for technical reasons and issues civil status certificates for recognised refugees. There is no provision in Belgian law imposing an obligation on the CGVS to take a decision within a given time in the regular procedure. Given that Bashir’s case came to a resolution in 2012, it is worth looking at the regulations that were in place in Flanders and Belgium more generally during 2012, when Bashir had his institutional encounters with the CGVS. At the beginning of 2012, the then Secretary of State for Asylum and Migration declared in the Belgian parliament that it was her intention to provide for a quick and high quality procedure that allowed applicants to have an answer within an average timeframe of 3 months at first instance or 6 months including a final decision on appeal. To achieve this, the “Last-In-First-Out” (LIFO) principle was introduced. This meant that priority was given to handling the most recent asylum applications, and the capacity of the asylum authorities was reinforced with an extra 100 (temporary) staff. This resulted in a considerable shortening of the total processing time of new asylum applications and a higher overall output that year. New applications lodged in 2012 were processed on an average of 80 calendar days. Although laudable when taking into account the backlog of older files (i.e. one or two years old), the average processing time was still 291 days at the end of 2013. Studies that, from an ethnographic interpretive perspective, have investigated encounters between asylum seeking applicants and authorities show that language is a key feature—but not the only feature—of such institutional encounters. Rather, it always involves a communicative event that sees the production of a ‘text’ about the identity of the applicant. The communicative event—either through oral, written or pictographic modes of communication (see Johnston 2008: 21–41)—draws on linguistic communicative proofs, i.e., which languages do you speak? How well have you mastered them? What do you not know of that language? However, it also draws on the factual knowledge the applicant holds (Blommaert 2001: 413–449) about the place he claims to come from. The text being produced by the applicant and the authorities during the institutional encounter of the long interview therefore serves the purpose of substantiating someone’s application and it does so by having the applicant match the expectations of the factual knowledge the applicant holds and can produce about the place s/he claims to come from. It is worth noting though that these encounters and the communicative events happening around the asylum adjudication do not only take place off line. Rather, as Jacquemet explains (2014: 201–202), the asylum procedure and its protagonists are part of a late-modern communicative revolution in which the technological development that grants the retrieval of information about a country or about a language spoken in a given country become tangible proofs of truthfulness, something I call here web-truths. In particular, examining a case of asylum in contemporary institutional realities, means that the analyst has to account for the implications brought to bear by the digitalisation of information, where digital information is overlaid, confronted and used to measure the first hand off line information presented by the applicant. It is therefore impossible to neglect that an asylum applicant, and those institutional figures called on to assess his case, cannot escape the power of technologies and the fact that these online aids hold a strong influence on the assessment of a case. Failure to recognise this can lead to disastrous consequences of communication breakdown due to intercultural havoc and identity dismissal leading to an application rejection. Such a heavily institutionalised process of acceptance or rejection involves several stages of text production and manipulation. First, there is the text that an applicant prepares—often orally together with other asylum applicants—before the interview with the authorities. Then there is the life-story text authored by the applicant during the long interview, an institutional encounter that has as its main purpose the gathering of the applicant’s migration history and motivation for filing a request for asylum. This text production process, often taking place either in a language that may serve as lingua franca or through the mediation of an interpreter (Inghilleri 2010), also sees the authorities involved in the entextualisation of the applicant’s story into a format, that of the legal case, that fits institutional preset narrative criteria. It is then the turn of the authorities to produce a transcription of the (recorded) long interview carried out with the applicant. It is this transcription then—an interesting trans-idiomatic textual product in its own right (Jacquemet 2009)—that once assessed turns into yet another institutional text; that of an official letter, redacted for the case of Belgium in either Dutch or French, spelling out the reasons that have led either to accept or reject the application. This decision letter—in our case a letter of rejection—serves the purpose of illustrating what it means to be an asylum seeker within the globalised politics of suspicion in Belgian Flanders. This study, part of a larger ethnographic interpretive inquiry entitled Asylum 2.0, builds on data collected through three rounds of sites visit aimed at shedding light on what it means to do asylum seeking in an age of globalisation both on and offline. In approaching this theme, I did ethnographic interpretive fieldwork at an asylum-seeking centre in Flanders, the Dutch speaking part of Belgium. The data for this case study were collected between the 13 and the 26 October 2012, during my first field visits to the centre. My position at the centre was that of a buffer zone between the staff and the guests. In fact, when asked by the guests—asylum applicants—who I was and what exactly I was doing there, I candidly explained to them that I was engaged in writing a book about what it means to be an asylum seeker and what asylum seeking implies, and that I was there to document their daily lives. All the participants embraced my doings and none of them opted out; rather they reacted enthusiastically to being made to feel that their lives mattered and that there was somebody interested in them and their experiences. Living along with them, having breakfast with them, talking to them while drinking endless cups of sweetened Afghani tea, following their daily doings that ranged from Dutch language lessons to knitting lessons, to gym activities to simply hanging around at the centre kicking a ball about in the evenings. In other words, what I did was deep hanging out in the cultural ecology of this institutional space. The project, in its ethnographic approach, combines insights, methods and epistemological as well as ontological stances stemming from linguistic ethnography (Blackledge and Creese 2009; Blommaert 2010; Rampton and Tusting 2007; Copland and Creese 2015) and socio-culturally rooted discourse analysis (Gee 1999). In both frameworks, there is the underlying assumption that the way individuals speak as well as speak about things reflects their culturally embedded understanding and their perception of the world. The centre, located in a formal cloister, has big rooms assigned to families and rooms assigned either to pairs of male or female individuals, on a first come first served basis. Rather than using a nationality based criterion or an ethnic grouping criterion, the director of the centre had opted—where he and his team members felt it not to be a risk—to put together people of different ethnic, linguistic and religious backgrounds. In October 2012, while I was engaged in my ethnographic fieldwork, the centre catered for 61 guests, an odd term used in the official jargon quoted by its director so to signify hospitality and inclusion (see also Gill 2016). Following the information gathered at the centre during intake talks, its guests were from the following (often pre-supposed) nationality backgrounds: 13 from Afghanistan; 12 from ‘The Russian Federation’—mostly from Armenia and Chechnya—nine from West Africa; nine from Bangladesh; seven from the Democratic Republic of Congo. The remaining 11 guests originated from what have been categorised as ‘other countries’ (andere herkomstlanden) in the unofficial statistics of the centre including various African countries, China - allegedly from Tibet - Albania and Ukraine. 40 of these guests were male, 21 were female. 11 of them were unaccompanied minors, though three of them still needed to give age-proof through bone scans. Only one guest had entered the centre in 2010 while the rest had entered in 2011 or 2012. Only two guests had passed their 50s, confirming the trend that seeking asylum is mostly a practice for either unaccompanied minors or young (often male) applicants ranging from their early 20s to their late 30s. All names given in this case study are pseudonyms so as to grant participants protection and privacy, and where necessary dates and locations have been removed. My chats with them were informal although I wrote synopses of the topics and the key points we discussed. Although video recording was not possible, audio recording happened when I felt a talk I just had was particularly interesting and revealed a facet of doing asylum seeking. In that case, guests were asked whether they felt like telling me their story again while being audio recorded. Access to their files—granted by the centre director and by the applicants—has helped me shed light on the same people but this time not from their first-hand lived perspective of doing asylum but through the legal lens that investigates the applicant during the whole procedure. Here too, guests at the centre were told of my access to their procedural files and were given the opportunity to either agree or disagree with it. None of them though disagreed. Of XXXX22 nationality and [ethnicity 1] ethnic origin through your mother and [ethnicity 2] through your father, you arrived on Belgian soil on XXXX and made a request next day for asylum XXXX. Next, while you said that you have lived all your life in the neighbourhood of XXXX, which is located in the municipality of XXXX, you were only able to mention four neighbourhoods in this municipality (see p. 14) and were not able to specify in which neighbourhood of XXXX you lived (see p. 13) although there are four: XXXX I, XXXX II, XXXX Mosque and XXXX Pharmacy. Next, you said that you slept with your mother for 10 days in a mosque, but you were unable to name it (see p. 13). Likewise, you could not give the name of any large mosque in [city] which is astonishing insofar as you say you studied the Qu’ran every day and that [a large mosque], is in front of the hospital where you claim to have taken your father (see the documents attached to your administrative file: XXXX published on XXXX.com, map from Google Maps, and article XXXX published on petitfute.com). In addition, although you could accurately quote the name of the most widespread bottled water, the currency used in [country], the [name of the governmental headquarters], the names of two mobile operators, and say what a “[specific musical instrument used in the region]” is (see pp. 15, 16), you were however unable to describe the [nationality] flag correctly or give the name of the [nationality] football team. Likewise, although you say you used to go to the market with your father (p. 7), you were not able to name it and when asked if you knew the names of the markets, you were content to answer “this is called ‘in the city’” (see p. 15). Next, you said that you watched television (see p. 10), but you were unable to give the name of any [nationality] channel, saying that you watched “[same nationality] TV channels. And also movies. I listen to music” (see p. 15). He3 then asked you if you knew the name of the large football stadium in [city], to which you answered in the negative and said that a site is currently under construction [elsewhere] (see p. 15). The original text of the rejection letter is in French, French being the procedural language through which the authorities corresponded with Bashir. Although I could not be present at the interview, there is no indication of the presence of an interpreter, which makes me assume that the interview took place in French, this being the working language of communication between the interviewee and the authorities. This text authored by the CGVS is an evaluation as well as a response to Bashir’s story. Its main aim is to point out the lack of factual knowledge and inaccuracy Bashir showed when answering the questions posed by the CGVS’ officers during the long interview. The above text, in summary, takes the form of a checklist. More specifically, a checklist that recaps the information that Bashir managed and did not manage to produce and that ended up disqualifying him as someone from the country in question and more precisely from the specific city Bashir claimed to be from. Bashir’s knowledge fell short when he was asked to name which of four areas he lived in.4 This lack of knowledge was compounded by Bashir’s not knowing the (official) name of any big mosque in the city, a lack of knowledge deemed astounding (etonnant) as Bashir claimed to have studied the Qu’ran every day, although without being specific on the whereabouts of his studies. Further, this astonishment came from the fact that a large, well-known Mosque—is located right in front of the hospital where Bashir had brought his badly beaten father (information about this mosque used by the authorities, however, is the official information available from the internet, including its official name). The link the authorities make in the text above is ergoic and runs as follows. If you really studied the Qu’ran then it means you should have studied in a mosque. Further, if you are really from the city in question you should be able to give the official name of the mosque you used to attend. Given that you cannot do so and given that—as we have retrieved from the internet—this mosque is large and well-known, then we can cast serious doubts on the truthfulness of your identity claims. The case of the naming of the mosque is of further interest because the authorities rely here on web-based information that uses the official name of this mosque. The first one is a website giving news about the country; the second is Google maps; and the third and most intriguing one, is petitfute.com—a website that gives handy tips to French speaking tourists wishing to explore far away exotic countries. The testing of Bashir’s factual knowledge that serves to prove his ‘indigenousness’ (or lack thereof) continues. As we read, Bashir was able to produce the name of the bottled water most sold in the country. He further was able to name the money used in the country and to explain what the specific musical instrument used in the region is, the name of at least two mobile networks operating in the country as well as the official name of the governmental headquarters. However, he failed to describe correctly the flag, or to name an unspecified football team. The final disproof of identity was his inability to name the market where he went with his father as well as the proper name of any market in the city, where he replied “this is called ‘in the city’”. He further did not know the name of any national TV channels to which question Bashir responded “the [national] TV stations and also movies and listening to music”, an answer that seems more apt to answer a question about his favorite pastimes. Last, he did not know the name of the big football stadium in the city. As explained in the final part of the letter, all these questions were considered manageable for someone of Bashir’s age and educational level. One day Bashir came into the room. He said yes (but) his mother did not trust him. He gave me […] to reassure his mother, he gave me the phone, so I had occasion to talk to his mother, so I then I spoke to his mother. So when I spoke to his mother, she asked me directly […]. She told me, my origin is [Bashir’s nationality], I, I […] I, myself, have been born in XXXX, she told me, I myself am originally from [town in the country in question]. From [same town] what, you? Yes, she told me Ah! Me too I am from [same town], which family in [same town] do you come from? Which family? The [X]’s family. So she said fine, I know them, the [inaudible], that family is well known there, and I believe you. Okay, your family, his family? But, but also, Bashir’s language, you told me that Bashir’s language is not the same as the one reported on the letter (the letter from the CGVS: MS). No, I have said, I did not confirm that he does not come from there, I say that he does not speak the language spoken there. He does not speak the language spoken there? Exactly, he speaks better the language of the capital, the XXXX language. Me too, I speak better XXXX then my mother tongue, the language of my mother and of my father, because I grew up in [city], you are forced to speak that language. But I speak French well too, that’s better here in Belgium. Is [it] very different from your mother’s and father’s language? Oh right, so that is XXXX. Okay, but, but, but, but […] but I spoke to Bashir, once or twice and his French is way different than your French. But yes, of course, it is not the same thing, I myself have studied, I have finished my studies, Bashir has not been to school. He has not been to school? Yes! I am convinced [of that: MS] because it is me, to whom he went to, when there was a letter to send or to read he asks me whether I can read it for him. He knows absolutely nothing in French. Okay, okay, so writing is also extremely difficult for Bashir, right? There you go. For him the motivation, they have asked him how many [wards], there are in [the city in question] […]. Yes, I know, I know, I have seen the report. There you are. He started to recite the [neighbourhoods within a particular ward] and he did not understand. Between [wards] and [neighbourhoods]. But it has only to do with the fact that Bashir has not gone to school and not because Bashir does not come from [the country in question]. The same thing goes for everything, the mosque, the market. The market is at the centre of town so for him that is ‘town’ and the mosque, well, that is one big Mosque, but there at home we call it the big mosque. Extract 2 shows how close Bashir was to Majid, asking him to read or write letters on his behalf implied a high level of trust. Second, we discover that Bashir, because of his lack of schooling, did not know certain (basic) notions like the difference between [wards] and [neighbourhoods]. Even more interesting is Majid’s insight into Bashir’s language repertoire. Aside from claiming that Bashir’s proficiency in French is very limited, French being the language in which the report was written and in which Bashir had decided to give his answers during the interview, we find also another interesting sociolinguistic element. That is—following Majid’s own self-reported language proficiency and meta-linguistic judgement on Bashir’s language repertoire—Bashir is mostly proficient in another language, a language that one who grows up in the city in question would know. This language stems from the same language family as Bashir’s father’s language. Although I did not have a chance to gather data on Bashir’s own sociolinguistic repertoire as he had already left the centre, Bashir’s reported sociolinguistic repertoire and the lack of schooling give an interesting insight into what might have gone missing with the naming of things during the interview which was fully carried out in French. Aside from the issue of the language in which Bashir was mostly proficient, it is also interesting to notice Bashir’s failure to differentiate between [ward] and [neighbourhood], as well as his inability to give the proper names for the market and mosque, all things that did not surprise Majid. In Extract 2, the names Bashir gave to places like the market and the mosque—which Majid too refers to as ‘the big mosque’ (la grand Mosquee)—are reported to be common naming practices ‘there at home’. Naming practices that do not match the register the CGVS’ authorities draw on through their web-gathered information. The ambiguous relationship between names and the things they refer to, e.g., places, has been a matter of interest for linguistic anthropology for decades and it has informed inquiries into the question of whether the name of a given thing is given from the point of view of the individual or of the collective. The relationship is not just reflective: rather there are processes of enregisterment at play that construct the practice of naming as local knowledge praxis. Given that enregisterment is the sociolinguistic process through which someone establishes the desire to be recognised as a specific someone (see Agha 2003; Karrebaek 2011), we shift the analysis here from differences between ‘languages’ to differences within languages, e.g., ‘ways of speaking’, ‘ways of narrating’, and ‘ways of naming things’. In sum, we take a close look at all those bits within language that make someone part of the appropriate register of belonging in that s/he narrates things the way they should be narrated and s/he names things the way they should be named. Bashir’s letter exemplifies that it is not only the process of naming but within that the process of enregistering (Agha 2003: 231–235) the names of things, like a mosque, in the way the authority wishes to hear them. More specifically, the process of naming is not solely an arbitrary process of making denotational and connotational meaning match one another. Rather, the process of naming comes with a history of use (inter-textuality), as well as with a history of sociocultural evaluation and assessment (a notion termed pre-textuality by Marijns and Blommaert 2002: 13). In the case of proper names, as Agha shows (2003: 247), the speech chain structure in which the action of naming is involved serves to maintain the coupling of a name with a referent, e.g., the association of a certain name with a given person or object. The fact that a name refers to that specific person or object is, at first, something shared by those who were involved in the immediate naming ceremony, e.g., an inauguration. It is then through the process of name transmission across socio-cultural networks, that other members become acquainted with somebody’s or something’s proper name even though they were not present at the naming ceremony. The naming ceremony therefore produces a continuous speech chain that needs neither to be attended to or verified but that needs to be known by those who claim to belong to that network. To link the above to my data, I refer to the different registers of naming public spaces of interest in the city in question drawn upon by the authorities and by Bashir, bearing in mind the specific reference to the naming of the mosque Bashir claimed to have attended while following Qu’ranic classes. In the case of the co-presence of a speaker, in this case an individual naming things, and of a hearer, in this case an authority figure hearing how things are named, the issue of matching register is key to understanding the breakdown reported by the authorities in this letter of rejection. Unfortunately, I could not be present at that interview nor could I get hold of the whole transcript of the interview as it was not in possession of the asylum-seeking centre. However, the text of the rejection letter reported in Fig. 1 and 2 and the counter evidence provided by Majid are both very telling. They show how Bashir repeatedly fails to match the register that is expected from him that is, the official register he should draw upon in order to have his voice recognised by the authority as indexing his indigeneity, an indigeneity embodied in the naming of things in the right way. In other words, what emerges from the letter is an act of (web-based) misrecognition in which the CGVS—an institution that clearly operates on behalf of the State—sees a lack of verification of the identity of the applicant. As Benedict Anderson states in his work on nations as imagined communities (1993), this register of talking about a nation embodies a set of prescriptions of what the other under scrutiny should say and know in order to have his identity match what the authorities believe that someone who is indigenous should say and know. The naming register used to define markets and mosques, or everyday items like money, are models of knowledge that link naming to indigeneity, leading to the socio-cultural recognition of the applicant as someone who is telling the truth. To rage against the bureaucratic oddity that is at the core of this study is of very little use. Rather Bashir’s case evaluation shows a glimpse of the valence of factual information for the assessment of identity claims in an asylum-seeking procedure (Ochs and Capps 1996: 417–419, deals with the indexical value of language). That is, the valence of Bashir’s claim is based on the complex associative networks that underpin the ideological expectations of what someone who claims to be from a certain place should know about that place and in particular, how he should express this knowledge. Further, what this paper has shown is not only evidence of how the emergence of register discrepancy gives way to misrecognition of identity claims. It also shows how identity is local knowledge dependent and it challenges someone’s authenticity where this authenticity is being judged by a different institutional matrix of knowledge. It is the matching or mismatching of the above that determines who may speak, what they may speak about, and, in particular, how they may speak about their own life history of migration. As in so many other domains of contemporary social life, language turns out to be a problem in the asylum procedure. The denial of its inter-lingual as well as intra-lingual complexity is a source of rather fundamental, though often invisible, injustice. The straightforward anchoring of a personal identity, a process fraught with complications even in homogeneous communities of people belonging to a single national entity, cannot and should not be taken for granted in asylum seeking procedures even when its demarcation seems to be helped by the omnipresent authority of the web. The term ‘ergoic’ is an adjectivisation of the latin causative conjunction ergo meaning in English ‘therefore’. Here and hereafter the ‘XXXX’s are included to protect the confidentiality of the subject. The ‘he’ here could either be referring to the interviewer or to a possible interpreter that might have been present to facilitate the interview process. The city in question is divided into what we shall call wards, with each ward consisting of more than one neighbourhood. Spotti, M. (2015). Asylum Seeking, Identity Techniques and the Paradox of Web Truths. Entry posted on Border Criminologies, Faculty of Law—University of Oxford. 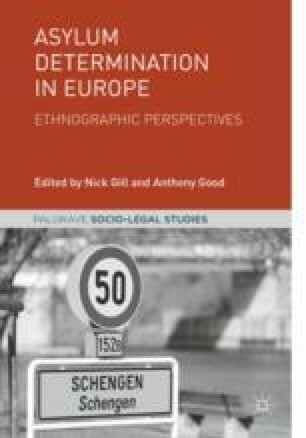 Available at: https://www.law.ox.ac.uk/research-subject-groups/centre-criminology/centreborder-criminologies/blog/2014/11/asylum-seeking. UNHCR. (2013). Global Trends 2012. Available at: http://www.unhcr.org/globaltrendsjune2013/. Open Access This chapter is distributed under the terms of the Creative Commons Attribution 4.0 International License (http://creativecommons.org/licenses/by/4.0/), which permits use, duplication, adaptation, distribution and reproduction in any medium or format, as long as you give appropriate credit to the original author(s) and the source, a link is provided to the Creative Commons license and any changes made are indicated.